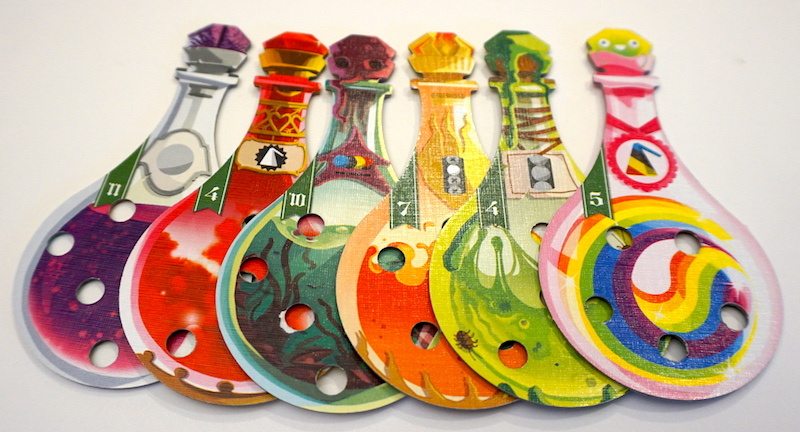 Potion Explosion is a tabletop game desigend by Stefano Castelli, Andrea Crespi, and Lorenzo Silva, and published in the U.S. by Horrible Games and CMON Limited. The setting for Potion Explosion is a laboratory for magic students. It’s time for the final exam; each student is racing to brew the most valuable potions and demonstrate their skills. After setting up the special dispenser and filling it with “ingredients” (marbles), the game begins. On their turn, each player may take one ingredient marble from the dispenser. If taking that marble causes two marbles of the same color to collide with each other, that triggers an “explosion”. When two ingredients “explode”, the player may take all connected marbles of that color. If the player can trigger a chain of explosions, they may take all the marbles that have “exploded”. 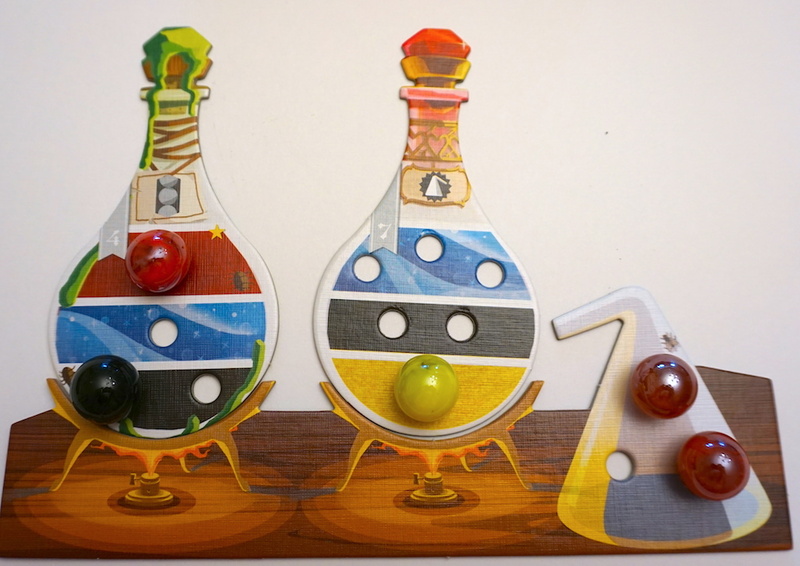 After taking marble(s), the player adds them to corresponding slots on the potions that are in progress on their desk. Once all slots on a potion are full, the ingredient marbles from that potion are returned to the dispenser. The potion is flipped to its completed side and moved below the desk. A player may “drink” one or more completed potions at any point during their own turn to use their special powers. Players are awarded “skill tokens” for completing 3 of the same type of potion, or 5 different potions. When all the skill tokens from the countdown stack have been taken, the end of the game is triggered. Once all players have finished the current round, the game is over. Points are calculated by adding up the value of each completed potion, plus any skill tokens (+4 points), minus any “little help” tokens used earlier in the game (-2 points to pull an additional marble during your turn). The player with the highest score, wins! 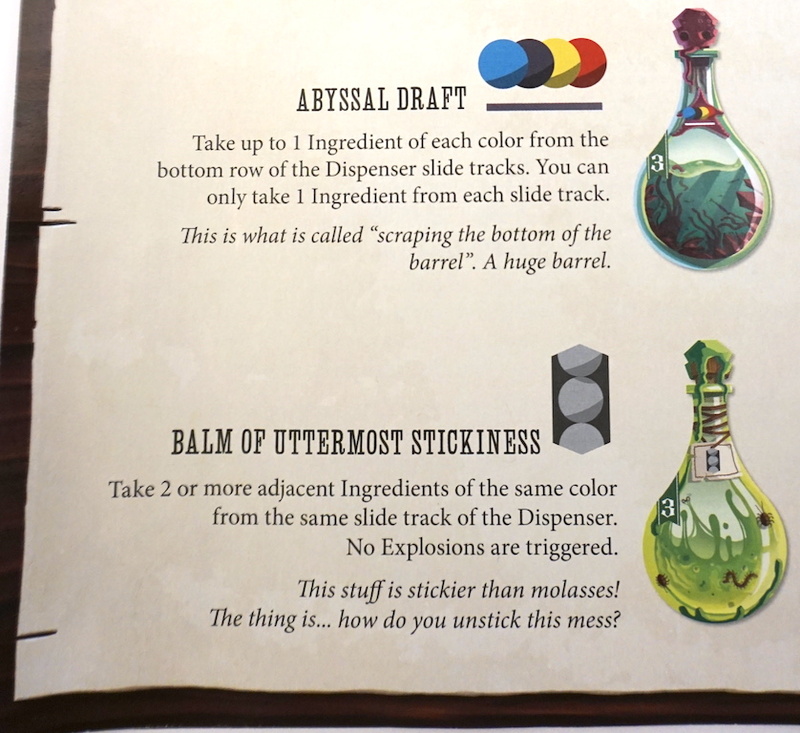 The strategy behind Potion Explosion isn’t particularly deep, but there are several aspects to balance – the potions have a wide range of point values, but low-value potions require fewer ingredients and should be easier to complete. Using completed potions wisely can lead to massive chain reactions, allowing a player to complete more potions efficiently. The artwork, from Giulia Ghigini, is fantastical. The rulebook text is whimsical, emphasizing the humorously magical setting of the game. Even the sides of the box continue the theme. Our whole family enjoys playing Potion Explosion. 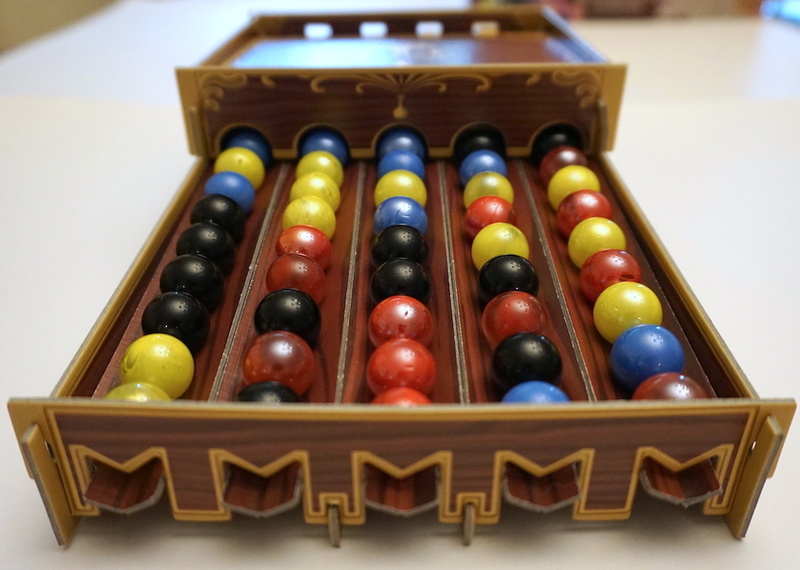 There is something viscerally satisfying about the clink of the marbles as they roll down the dispenser, and it is undeniably rewarding to cause “explosions” and take more marbles. The 14+ age range marked on the box seems high, since our 8 year old has no trouble playing Potion Explosion. Even our toddler loves pouring the marbles back into the dispenser and matching up the colors to their corresponding spots in the potion “recipes”. Although it could easily be just a gimmick, Potion Explosion feels substantial. All of the elements work together to create a tangible and fun experience. There is something magical about a game that is so fun to play, it’s nice to win but not terrible when you lose. This is the magic that Potion Explosion really captures. We highly recommend Potion Explosion for all ages. Pick it up at your local game store or on Amazon.